(Newser) – The Rev. 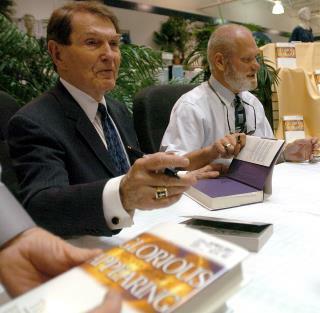 Tim LaHaye, co-author of the Left Behind series, a literary juggernaut that brought end-times prophecy into mainstream bookstores, died Monday, the AP reports. He was 90. LaHaye died in a San Diego hospital days after having suffered a stroke, according to his publicist Johnnie Moore. Co-authored with Jerry B. Jenkins, the 16-volume Left Behind series sold more than 80 million copies worldwide, Moore said, and popularized a Bible interpretation that said born-again Christians will be instantly taken to God in the rapture, while those left behind on earth endure seven years of tribulation. LaHaye was a key figure in conservative political groups, encouraging the Rev. Jerry Falwell to create the Moral Majority and forming the Council for National Policy, a secretive strategy group for prominent political and religious conservatives. God will burn, torture and mutilate you ...but he loves you and is really kind. Luckily he died in ignorance of the fact he wasted the only life he got pretending to be someone he wasn't. Off topic, but he looks vain in his picture. I'm thinking he had plastic surgery and dyed his hair.